This program is a research-based exercise design program for shallow depth. It provides leaders with functional techniques to design safe and effective programs for a variety of ages, skills and fitness levels. This foundation program will provide you with a complete overview of how to facilitate motivational & enjoyable group exercise programs. 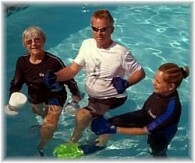 You will experience both theory (classroom) and practical (pool) applications to build a well-balanced program. NO Experience necessary – just a love of the water and fitness. 8.0 CEC’s for AFPA, YMCA, WaterART, AEA. Certification Diploma and recognition when you are successful with the exam. The exams are completed via a take home exam that you have up to four months to complete. Theory exam is open book – take home & you may mail or email the answers. The practical exam may be completed either via an onsite assessment or VHS video/DVD/USB submission. You may decide at the course how you would like to complete the training. • Review current research on water fitness. • Understand the difference between land and water exercise. • Explore the powerful properties of the water. • Learn the basic water moves & variations. • Design TARGET TRAINING SETS for cardiovascular, muscular endurance & strength, flexibility, and weight management components of the class. • Learn BLUEPRINT DESIGN for shallow and deep water depths. • Investigate effective communication techniques using both visual and verbal cuing system. • To teach safely either on deck or in the water. • Examine the major muscle groups and their joint action. The practical exam will be completed via an onsite practical assessment & take home theory exam. Must be completed within 4 months (after the course) or there is a $35.00 penalty fee. Materials will be given out at session UNLESS requested in advance for $15.00 shipping fee.